The Parsis are the descendants of a Zoroastrian Iranian emigration to India that is thought to have occurred in the 8th century. They are followers of a religion of ancient Persia founded by Zoroaster (also called Zarathustra), the Iranian prophet of religious reform. Zoroastrianism is one of the world’s great faiths that bears the closest resemblance to Judaism and Christianity. Parsis believe in one indivisible God, who is the beginning and the end, who is all good; no evil originates from Him. A continuous war between the forces of good and of evil (purity and pollution) is supported by believers with good deeds, good thoughts and good speech. God is represented in their temples by fire, symbolizing light. 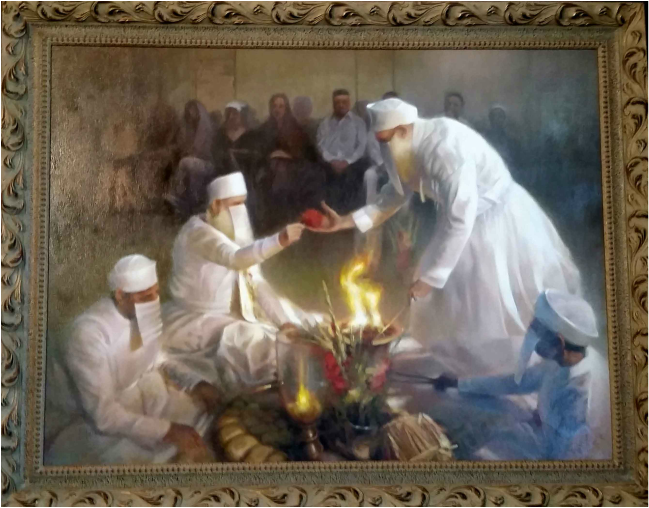 Rituals of initiation, marriages and funerals are important aspects of Parsi life. At a Parsi wedding, the priests wear snow-white vestments, the color of purity and holiness. Red pigment plays an important part, substituted as a symbol of the blood of the former custom of animal sacrifice.